Ever since we were taken through the work of Gursky at college, then sent out to take an image in the style of Gursky, I see layers and repeating patterns everywhere… it’s the allure for all photographers and viewers, even when they don’t consciously know it. Personally, Gursky is good but not great, but it does prove to be friendly with a curator in a city where really stupid people tell other people what’s good (seriously, in New York their reviews are such works of fiction that I am in awe… do you detect a hint of bitterness? Not a hint, a good dash of it! I see better images on WordPress that deserve some wall space and greater appreciation, marketing and networking are as important as the eye! 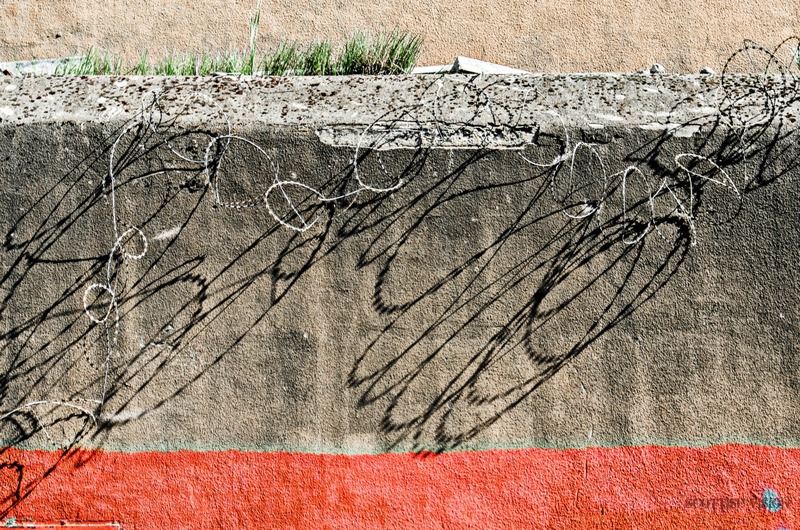 This is a wall, yup, a wall, but the tones worked and I’m pretty sure it wasn’t intentional… I really liked the fact that the barbed wire was detached in places and the light helped the shadows look like writing (well, a signature! ), a little bit of tension in a layer helps!